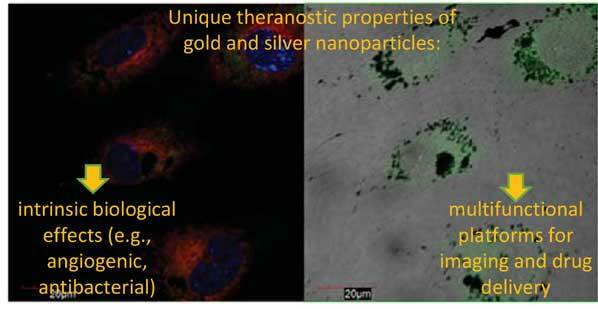 Noble metal nanomaterials, such as gold or silver nanoparticles, exhibit unique photonic, electronic, catalytic and therapeutic properties. The high versatility in their synthesis, especially size and shape features, as well as in the surface functionalization by, e.g., physisorption, direct chemisorption of thiol derivatives and covalent binding through bifunctional linkers or specific affinity interactions, prompted their widespread and rising use as multifunctional platforms for theranostic purposes. In this paper, the recent developments of gold and silver nanoparticles for application in biosensing, medical imaging, diagnosis and therapy is reviewed from the following five aspects: (1) the gold and silver nanomaterials intrinsic properties of biomedical interest; (2) the synthesis of noble metal nanoparticles by chemical, physical and biological/green processes; (3) the applications of gold and silver nanoparticles in imaging, diagnostic and therapeutic mode; (4) the surface functionalization processes for targeting, controlled drug loading and release, triggered pathways of cellular uptake and tissue distribution; and (5) nanotoxicity. The historical developments and the most recent applications have been focused on, together with suggested strategies for future more efficacious, targeted delivery. Drug delivery, Imaging, Metal nanoparticle, Nanomaterial synthesis, Nanotoxicity, Plasmonics, Surface functionalization. Department of Chemical Sciences, Catania University, P.O. Box: 95125, Catania, Italy.